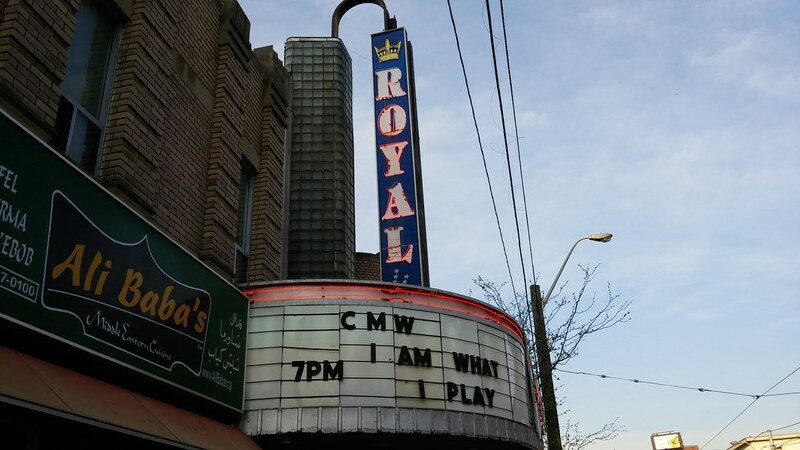 I attended the Canadian premiere of I Am What I Play at The Royal last night. You might recall me writing about this documentary. It features Meg Griffin, Charles Laquidara, Pat O'Day and our very own David Marsden. Marsden was at the premiere, and we chatted before the curtains went up. A number of old CFNY staffers were there, as well as radio fan Erin Davis who gave me a big hug. It was a great atmosphere. And for this longtime fan of radio, it was a great doc. Aside from Marsden, i was only slightly familiar with Meg Griffin from her appearances on Howard Stern. The others, Charles Laquidara in particular, were great story tellers. And that's what makes Marsden so great. The man is an excellent storyteller, with fantastic stories to tell. It's why his appearance in episode 106 of my podcast is one my personal favourites. I Am What I Play features plenty of great Marsden tales with old audio, video and photos I had never seen. I've finally heard what Dave Mickie sounds like! If you love radio, you'll adore this doc. It's also got a great soundtrack and closes the only way a good radio story should. I so wanted to see "I Am What I Play" last night, but was unable to. My impatience will continue until I learn about the next opportunity to see it. David Marsden and Roger King are being interviewed on CFRB right now. Humble and Fred had Roger King on recently, modest guy, let the documentary subjects be themselves and relate their stories. Will this be on Netflix or hosted for viewing on Youtube? I have many hours of worth of airchecks from Charles Laquidara's station WBCN, Boston. They will remind you of CHUM FM at it's free form best. The musical diversity is amazing and some great commercials, PSA’s, newscasts. An excellent time capsule into the past and counter culture programming. I have perhaps up to nine hours of BCN and have uploaded almost two hrs with more to come gradually Ccharles is on one of the ones I have uploaded. Did you stay for the Q&A? Was anything mentioned about college radio (either in a question or answer)? Yes, I stayed for the Q&A. Someone asked if there was any hope for radio and David said the platform wasn't the problem, it's the content. Nothing specific about college radio, though. I used to believe the platform might be able to flourish. I do not now. We're already seeing FM radio being deprecated in certain countries with more on the horizon. The current revenue model of radio simply isn't working to offer the variety people expect. I believe talk and news radio will continue, and stations that play a CHFI sound will continue. Top 40 might hang around a while too. Radio will becoming all internet streaming, specially when IPv6 becomes common place (multi casting). Marsden can believe what he wants but sometimes "good tech" disappears. HAM radio is smart tech. It's uncommon. The "land line" is smart tech too. It's dying. A TV antenna on your house makes more sense than it has in 30 years but it's not common. FM radio is in decline. No amount of content will save it.